A lightweight, inexpensive wet/dry vacuum, the ArmorAll AA255 is a versatile cleaning tool, particularly for families with long-haired pets. It runs quietly and picks up so much hair and dander; it can cover a house multiple times before it has to be emptied. 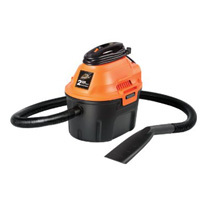 We were impressed with the suction and blowing power of this little wet/dry vacuum. We were pleased with the assortment of attachments included, which are suited to just about any type of cleaning task, big or small. If you’re looking for an affordable vacuum to use in your car or around the home, this ArmorAll vacuum is an ideal choice.